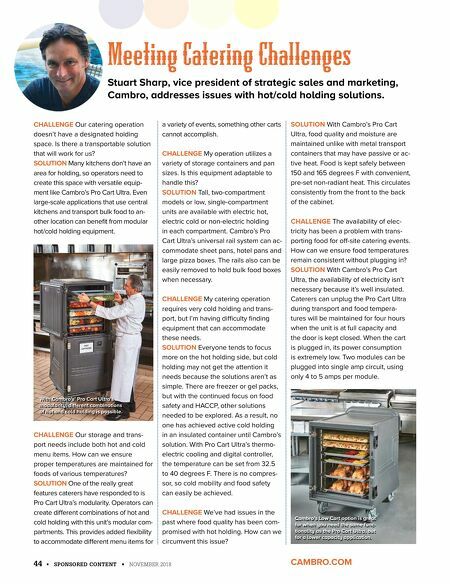 www.cambro.com (800)833-3003 Pro Cart Ultra ® ELECTRIC COLD Digital controller allows cold to be set from 32.5˚to40˚F (0.3˚ to 4.4˚C). Keeps food safely between 150˚ to 165˚F (65˚to74˚C) with convenient, pre-set, gentle, nonradiant heat. 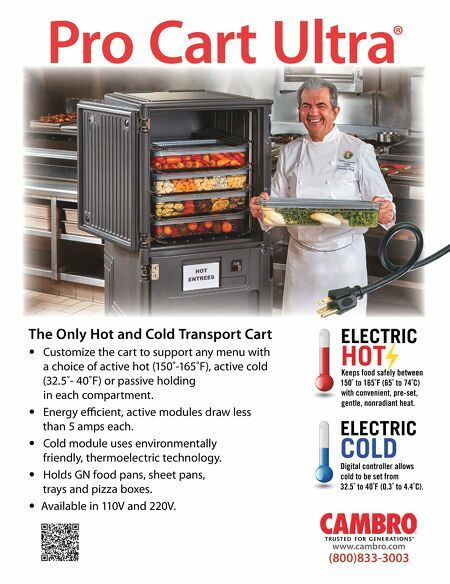 ELECTRIC HOT The Only Hot and Cold Transport Cart • Customize the cart to support any menu with a choice of active hot (150˚-165˚F), active cold (32.5˚- 40˚F) or passive holding in each compartment. • Energy e- cient, active modules draw less than 5 amps each. • Cold module uses environmentally friendly, thermoelectric technology. • Holds GN food pans, sheet pans, trays and pizza boxes. • Available in 110V and 220V.